The Mobile Operating System competition is yet to be begin because Mozilla Firefox has also engaged itself into Mobile OS market with the introduction of Firefox Mobile OS, Codenamed "Boot to Gecko", the Firefox OS operates on HTML 5 which will allow web apps to make full use of the Mobile device’s hardware for better performing applications. 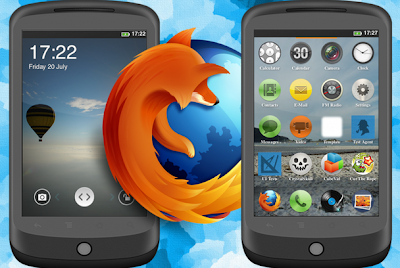 Mozilla has just started Firefox OS in the form of beta testing and they are all set to take some market share from the Apple iOS and Google Android mobile operating systems. Mozilla Firefox Mobile OS has first been made available for the tablets and smartphones and is available for testing on Mac OS X, Windows as well as Linux machines. According to Mozilla's spokesman Chung; Firefox OS is currently only available for Developers who wants to test their WebApps and for those who wish to help in testing, desktop builds allow looking for test plans as well as file the bugs. "Boot to Gecko" is the codenamed of Firefox Mobile OS and the very first device of Firefox Mobile OS will run the Qualcomm Snapdragon processor, which will be available in the year 2013 in Brazil through Telefónica’s Vivo service, as told by Mozilla Firefox. Various other mobile operators can offer Firefox OS devices and these include Etisalat, Deutsche Telekom, Telecom Italia, Telenor, Sprint and Smart. Mozilla Firefox Mobile OS will offer most advanced features to its users such as contact dialing, messaging, web browsing, gaming, video viewing and transfer of media through the popular bumping technique and a lot more as developers start getting involved with HTML 5. It’s very early to say how Mozilla Firefox Mobile OS will run and perform tasks on Mobile devices until the Mobile OS is actually deployed on any device with impressive hardware and software features. Currently Mozilla has made builds for Developers who can Setup, Test and Install Firefox Mobile OS on Windows, Linux and Mac operating systems. The Mozilla Firefox OS builds is only for developers to test their Apps but general public can also install Firefox Mobile OS for testing but the procedure of Installing, Testing and Setup Firefox OS on Windows, Linux and Mac is quite lengthy and users have to be careful when trying it. So install it at your own risk. How to Setup, Test and Install Mozilla Firefox Mobile OS On Windows, Mac and Linux PC Desktop? First you should check out and read the Mozilla's official guidelines and instructions involved with Development and Testing of Firefox Mobile OS from here. Now follow the following Steps and Guidelines to Setup, Test and Install Mozilla Firefox Mobile OS On Windows, Mac and Linux PC Desktop. Step 1: Setup and Create Gaia profile prior to launching the B2G Desktop build from here. Step 2: Download and Install nightly "B2G Desktop" build for Windows, Mac OS X and Linux operating systems from here. Step 4: Congratulations!! You're done and now you should see Mozilla Firefox Mobile OS Contents on your PC Dekstop. Step 1: Download and Install nightly "B2G Desktop" build for Windows, Mac OS X and Linux operating systems from here. Step 2: Download the missing profile (35 Meg) and unzip it on your Windows Desktop machine from here. Step 3: Right click on the b2g.exe file and select create shortcut. Step 4: Right click on the newly created shortcut and add the following after b2g.exe -profile "<path to downloaded profile directory>". Step 5: Now when you click on the shortcut it should load "B2G Desktop" with the Mobile Phone interface. Step 6: Congratulations!! You're done and now you should see Mozilla Firefox Mobile OS Contents on your PC Dekstop.